Recently I was approached by the developers of a new app Epic! – Books for Kids, asking if I would like to review the app. I have reviewed several great kids book reader apps that are subscription based and I think this is a great way to get kids reading more. The app is basically a reader app offering access to a collection of books for kids. Users pay a monthly or yearly subscription to access all the books. You can think of this as a paid library for kids. There are over 2000 books for kids, and the collection is updated weekly. The monthly subscription is $10, and yearly subscription is $80. The tricky part of this app is, unlike most other reader apps, you don’t get to see what you get till you subscribe for the membership. The first month is free, but after that it is auto-renewal, unless you manually disable the auto-renewal. What is even trickier is, with the iTunes system, you can’t just disable the auto-renewal in the app, you have to do it in your device setting, and the app offers no instructions on how to do it. So the question becomes if it worth it to subscribe for the membership? I think it all depends on what you are looking for. Here are some of my observations that I hope can be helpful. 1. Good selection of books, grouped by age and subjects. Once you open the app, you can browse for book titles. On the right side of the screen, you can select age range. The app has 4 age groups: 4 and under, 5 to 7, 8 to 10, and 11-12. Under each age group, you will see sections by category: Recommended for You, Picture Books, Non-fiction, Humor, Sports, Historical, Fantasy, Adventure, Comics and Graphic Novels, Mystery, Fiction. These categories are the same for all 4 age groups, with different books understand each category for different ages. 2. Covers wide age range, with books ranging from picture books to chapter books. Many book readers are designed for younger age groups, it is hard to find books for kids who are on chapter books. There is a good selection of books for advanced independent readers. 3. Can download the books to read offline, which is great for travel and commuting time. 4. No interaction on the book pages. This could be bad for some, but good for those would rather read books like print books. They are basically like Kindle books, no sound, no interactive features, just plain books. 1. I can’t see the content before subscribing for the membership, and the complicated process to disable the auto renewal. As busy parents, how many of us will remember to do it to make sure we are not charged more than we want to? I highly encourage the developer to change the setting to allow parents real free access to the books before making purchase decisions. Word of caution: If you decide to disable the auto-renewal, make sure do it in the device setting, as nothing in the app can make it happen. Simply deleting the app will not discontinue the auto-renewal. Even if the app is not on your device, the auto-renewal is still on. You have to go through the disable process to stop it. 2. Not a real personalized book suggestion. There is no place for the users to put in personal information, such as age, reading level, and interest. The book suggestion is shown once you select the age group on the opening screen, so it is just a suggestion for the age group in general. 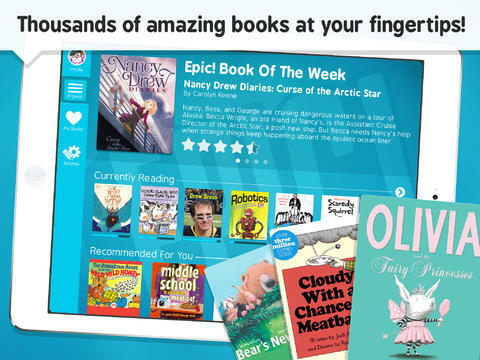 Overall it is a good reader app for kids covering a wide age group with good selection of books. If you have an avid young reader at home this could be a good app for you. For $10 a month or $80 a year, you have access to many books that you can choose from. It is a handy library. Just remember, if you decide to discontinue the membership, even if just a free membership for one month, you have to go to your device setting to discontinue the auto-renewal. Epic is available on iPad. It costs $10 a month and $80 a year to access the books.